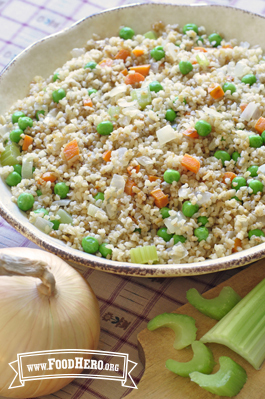 2 Comments for "Bulgur Pilaf"
This was another winner - yummy and fast!! Honestly I had never made bulger like this -- being the star ingredient in a recipe. Everyone loved it, including my 2 year old who kept eating and eating and eating. I was a bit in shock, happy shock! Another commentor mentioned it was like fried rice which made me think I could likley make this into a main dish next time by adding stir fried tofu and some scrambled eggs! me of Fried Rice when I added peas.